This is the first in an occasional series of great graveside movie scenes. 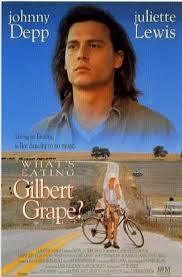 What’s Eating Gilbert Grape (1993) is my favorite movie. The perfection of the film needs to be the subject of another (long!) blog post. Of course, you can’t have a great movie without a good book on which it’s based, the 1991 novel by Peter Hedges. This is a rare example of where the movie is as good (may I say, even better?) than the book. The movie stars Johnny Depp, Leonardo DiCaprio, and John C. Reilly before they became huge break-out stars, back when they were starring in thoughtful, indie movies rather than in pandering-to-the-masses blockbusters. 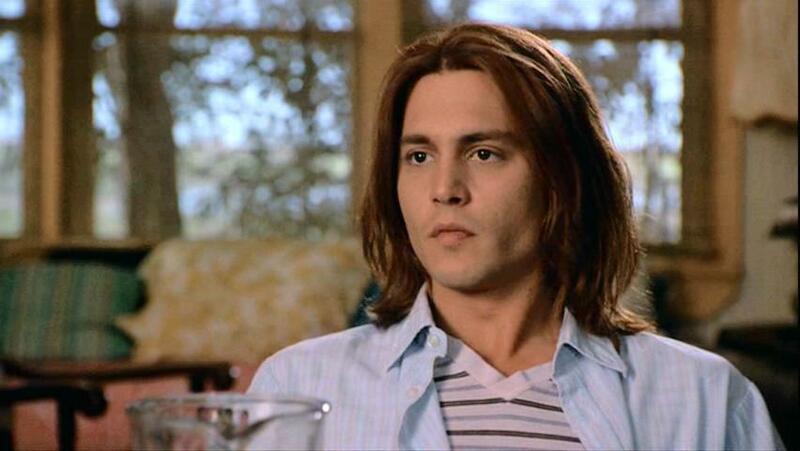 Johnny Depp, after “21 Jump Street” and before Jack Sparrow and Tonto. I’m no Johnny-come-lately to Johnny; I’ve been a fan since the late 1980s. This scene takes place at the graveside service of Ken Carver, the small town’s insurance agent. All of the main characters are there: Gilbert (Depp), the young man who feels trapped by the small town because he’s the head of his family and has to take care of his severely obese mom and developmentally disabled brother, Arnie (DiCaprio); Tucker (Reilly), one of Gilbert’s buddies; and Mary Steenburgen, starring as Betty Carver. What is a graveside movie scene without something going terribly awry? A graveside service is the perfect moment to insert tension, drama, conflict. Otherwise it wouldn’t be worth mentioning in a book or movie, right? My favorite part of this scene is the look on Tucker’s face when he realizes the Burger Barn is finally coming to town. Prior to this scene, the Burger Barn is all that Tucker can talk about. The coming of Burger Barn, a fast-food restaurant, is the best thing that’s happened to this dying town in years. It’s the type of event that surely made the front page of the local newspaper, probably for many editions in a row. Tucker has been named manager of the Burger Barn, hence his sense of pride when he sees the building passing by. Even though the scene takes place at the burial of Ken Carver, we also get a metaphorical sense that the town is dying, and that Gilbert, too, is dying a little inside, trapped in a situation from which he thinks he cannot escape. Will he be working at the tiny grocery store for the rest of his life? Will he ever get out? Will he ever be able to pursue his dreams or is he destined to always be the family’s caretaker? When the fun-loving Becky (Juliette Lewis) comes to town, we get a chance to find out. Have you seen or read Gilbert Grape? What do you think? What’s your favorite movie graveside scene, and why? I have others in mind that I’ll be posting in the future. I forgot that Crispin Glover was in this movie. But, well, it’s only been twenty years since the last time I saw it. 😉 I remember the death of the insurance agent (the marvelous Kevin Tighe) in the kiddie pool better than I remembered this funeral scene. A fine choice, this scene, by the way. I’ll mention a TV show instead of a movie. I’ve always thought the funeral scene for Laura Palmer in Twin Peaks was especially memorable. From Bobby Briggs erupting at the hypocrisy of the townsfolk to the absurdity of her father falling on top of her coffin. I LOVE this movie, for so many reasons. Top of the list is the amazing skills that DiCaprio shows as an actor. To be that young, and to play Arnie with such depth…I am still blown away by his performance. My very good friend and I will often text “match in the gas tank, boom, boom” to each other whenever we are having a stressful day. Seeing as the Grape household becomes a cemetery in its own right, I think the scene where the watch it burn is an equally powerful cemetery film moment. I haven’t watched this movie for a while. All this talk about it makes me want to make time for a viewing! Do it! It’s even on Netflix, doesn’t get much easier than that!